Penn Plax Cascade series include 5 models (Cascade 500, 700, 1000, 1200, 1500) used for different aquariums up to 200 gallons. They are the most popular external canister filters on the market today because of their powerful features and very affordable prices. This review will cover all powerful features of this series as well as provide you the method to set up and maintain the filters in the proper way. 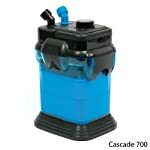 Cascade 700 (FR: 185 GPH) for tanks up to 65 gal. Cascade 1000 (FR: 265 GPH) for tanks up to 100 gal. Cascade 1200 (FR: 315 GPH) for tanks up to 150 gal. Cascade 1500 (FR: 350 GPH) for tanks up to 200 gal. Penn Plax Cascade series canister filters efficiently provide powerful water flow and multi-stage external filtration system, which really get the job done. 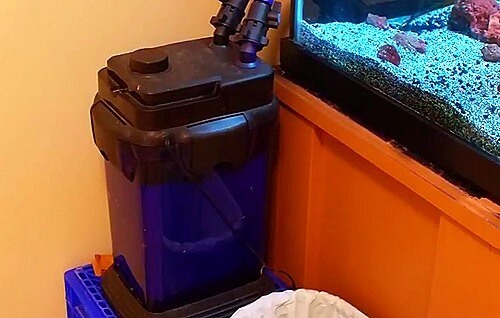 The filters are designed to be utilized on both fresh or salt water aquariums. Its color is cobalt blue and looks great next to any tank. The flow rate is high enough to constantly keep the water circulated and filtered that ensures any toxic fish wastes are transferred. There are control valves for adjustment of the flow rate to perfectly fit your aquarium sizes and fish types. The control valves are also used for shutting off the water flow for maintenance easy without leak and mess. The product comes with start-up filter media, in addition to large filter trays. There are many baskets for containing filter media that makes it possible for the combining of multiple media delivering and multi-stage filtration. This is the combination of chemical, mechanical, and biological filtration that generates a fresh and healthy environment for aquarium creatures. The large filter chambers, which enable you to utilize more media plus, are the most favorite feature of Cascade series. 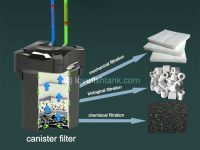 Whereby, the filter can accommodate a large amount of filter media for the better filtration and longer maintaining periods. 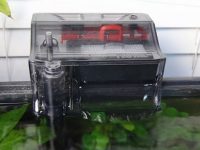 You can use the media come with the product or choose ones as you think best for your fish tank. You can use various media combinations, in order to accomplish a wide array of filtration as your needs. This includes bio-sponges, bio-floss, or activated carbon. 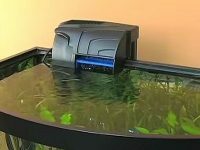 The more media you use the cleaner your aquarium and the less maintenance you have to do. Like Fluval 06 series canister filters, the installation of Penn Plax Cascade series canister filters is very simple, even easier because everything you need is accessible. 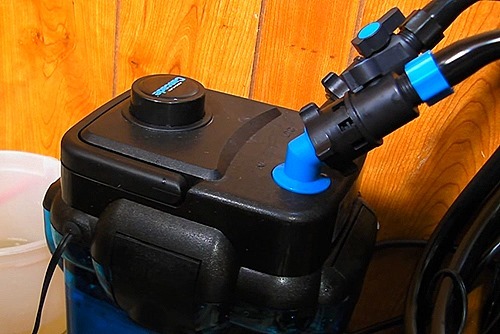 Once installed, the filter works fast to keep your aquarium clean and clear. The filtering process will engage in about thirty minutes after installation and visible improvements can be noticeable less than a day. The filter features a self-priming button on the lid for easy starting, just press the button several times until you get water flow from the intake tube going down into the filter. 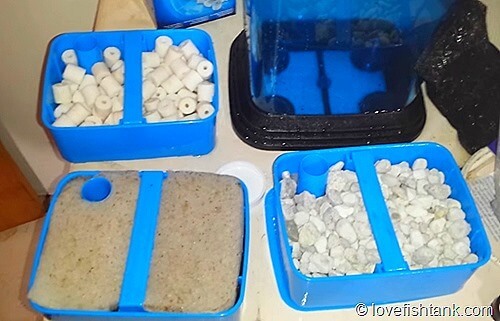 And then, the filter do its works to keep your aquarium clean and ideal for fish. Moreover, Penn Plax Cascade series filters own some other wonderful features of Fluval 06 series make it easy for setup and maintenance. There are two independent directional 360-degree rotational valve taps for worry free placement. Swimming pool-style hose clamps make it easy to assemble as well as disassemble the filter for setup and maintenance easier. Flow-rate control valves allow for adjustment of the flow rate or shutting it off for easy maintenance without leak and mess. The directional returns aid in suspending waste matter which enables it to be taken in by the filter, and leaving nothing but clear, fresh water. Easy-lift clamps make it easy to remove the cover for maintenance. Simply release the vacuum and remove the top for cleaning, changing filter media or additional maintenance. Air-tight seal assures proper flow rate of the filter and allows for very quiet operation while it is working. Mounted tip-proof rubber base keeps the filter in place. Loved and praised by a lot of hobbyists. Some of the trays do not fit snug allowing some water to bypass the media. This can be easily solved by sticking filter floss into the side areas. The motor and pumping parts of the Penn Plax are sealed, you can’t get inside to clean out any residual waste matter, algae, or whatever else happens to build up inside the unit. Prepare filter: Open lock clips. Remove motor unit. Remove filter baskets from filter case. Prepare media baskets: Filtration works from the bottom up. Use floss pad and carbon bag in bottom basket. Use floss pad and coarse sponge pad in top basket. Reassemble filter: Place seal ring, connector and media basket cover over top basket. Slide media basket clips into slots on sides of top basket. Note that small opening on motor unit must align with holes on basket. Position the filter: Choose a location for the filter where it can be easily accessed for maintenance. Do not attach hoses yet! Note that hoses with valves will easily detach from motor to remain at aquarium during filter maintenance. Hose attachment: Attach hose to intake tube. Use tube with blue hose ring. Attach intake tube extension and strainer. Use two suction cups to secure intake tube to aquarium wall. Exhaust hose assembly. A spray bar or a directional spout as you want. All of these equipment help to break surface water to provide oxygen exchange for your aquarium. While the directional spout creates a forceful circulating flow in any direction, the spray bar evenly distributes filtered water across length of aquarium. If you prefer to position the directional spout or spray bar above water level, use the two extra elbow connectors to connect them. Do I need to adjust the out and intake valves equally to slow the strong current for the fish? Even with the spray bar it is strong.i do not want to blow anything like gaskets. Hi Nancy! Only adjust the outtake valve is enough. How many gallons is your tank? Which Cascade model do you use for the tank? I think you may use a model over rated for your tank volume. I have a Penn-Plax Cascade 700 filter for my 65 gallon aquarium. I’ve progressively found it harder and harder to detach and reattach my hose valve lock rings to my intake and exhaust ports on the canister when I remove the canister for cleaning and replacing filter media. Do you have any idea what I can do? On my last cleaning this week I could barely get the lock rings off the ports. I’ve been looking into a new filtration system due to this difficulty. I think your lock rings may be damaged making it hard to handle with them. As normal, this process is so very easy for other people who own Penn-Plax Cascade canister filters. You don’t need to change your current filter because you can find another Flow Control Valve Set for the filter on Amazon. I see some people have the same problem with you and they have solved it with the small replacement. I’ll see if I can find replacement valves on Amazon. 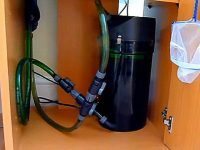 I’m looking into purchasing a Penn Plax and I’m working with a 50 gallon fresh water tank. What size do you recommend, I’m thinking about the 100 gallon just to be on the safe side. Hi David. The Penn Plax 1000 (for up to 100 gallons) features a flow rate of 265 GPH and is just fine for your 50 gallon fish tank. I bought the cascade 1500 for my 70 gallon tank. After setting it up everything worked fine until the water bar made some squeaking sound as if it didn’t have enough force for it to flow smoothly. i kept pummping to get the air out but nothing worked. Then it just completely stopled working. Can anyone tell me what went wrong here? Hi Nancy! It seems the problem comes from the motor gasket. Are you sure if it is for a Cascade 1200? Could you send me a link where you buy it? I find a replacement o-ring on Amazon: https://www.amazon.com/Replacement-Impeller-Retainer-Ring-Cascade/dp/B0018CLGRK. Hope it can help you. can i use cascade model 1000 to a 30 gallon planted/shrimp tank? The Penn Plax Cascade 1000 with a flow rate of 265 GPH produces too strong water flow to stress your shrimps. I don’t know the output water flow after adjusting to the minimum flow rate and adding filter materials. Commonly, for freshwater species, you should ensure that the final flow rate isn’t higher than 4 times of your aquarium capacity (<=120 GPH for your tank).